An error occurred while adding this item to the shopping cart. We're sorry. You want to purchase more samples than are currently available. At the moment you can add samples of the product to your shopping cart. protect °SensoRed® nonstick wok pan - frying finally made simple. 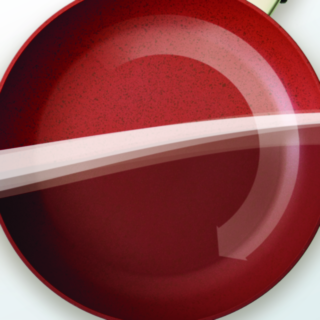 SensoRed is an exciting new innovation in woks. It utilizes a thermo-sensitive nonstick coating to let you know when the right frying temperature has been reached. When heated to the optimal frying temperature, the entire surface of the SensoRed wok changes to the color of the speckles in the nonstick coating. This is your visual indication that it is now the ideal time to cook your food. The SensoRed innovation ensures that food is never placed in a wok which is too cold or too hot. With its outstanding nonstick properties, SensoRed provides an easy way to achieve ideally fried food and perfect results. No reviews available for this product yet. Add the first rating for this product. We have chosen the hardest way to make frying easier and the result is not only hard as nails, it is also yet so easy to handle! Delivery takes place within 2 to 5 business days.